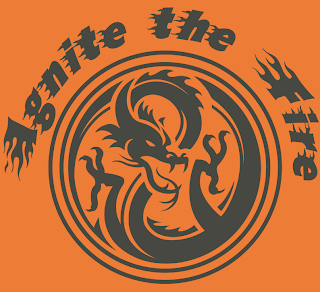 "Come shop for a variety of handmade and unique craft items and more. Free admission and prize drawings throughout the day! Hosted by and benefiting the Durham Middle School Band." 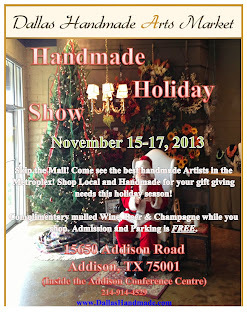 "Join us for our 2nd annual Handmade Holiday Show. Our Biggest event of the Year. 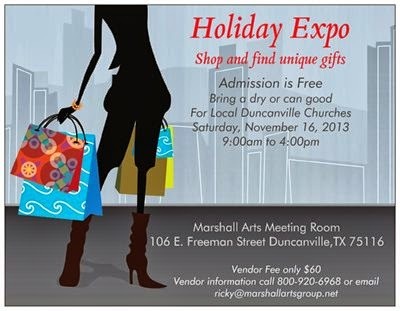 The best and talented artist will be showcasing their latest creations for your gift giving needs! The Mayor of Addison, Todd Meier will be kicking off the Show at 1 PM on the 15th, Media/Press has been invited. Live music performances playing your favorite Christmas songs all while you shop. Complimentary: Hot Chocolate & fresh warm cookies (weather permitting), Wine, Beer, Soft Drinks, and bottled water. Mimosas on Saturday & Sunday! Cape Cods on Friday!" "Come to our indoor/outdoor event with over 50 vendors selling craft and business items - including Tupperware, Chair Massage, Origami Owl lockets, “31” bags, princess tutus, AVON, Children’s clothing & bows, Scentsy, wood & metal art, Artisan soap, candles, books and much more! Food, bounce house and face painting for the kids, free door prize drawings on the hour. Located at Horizons Church, north of Dallas off Hwy 121 and the Dallas Tollway. 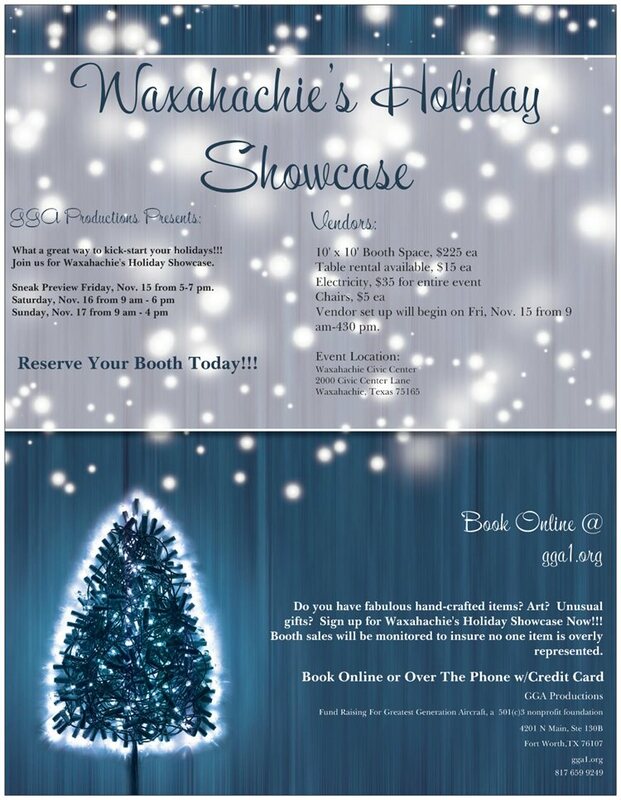 "This craft show will be held at Waxahachie High School on November 16th to raise monies for our Student In Need Club. The Craft and Gift Show is predominately hand made crafts with some other. We have everything you could want for gifts. Come get your Christmas shopping done early." 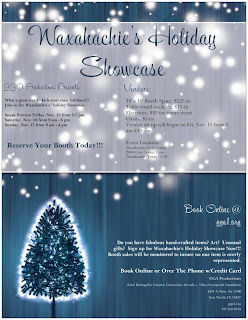 "Westminster Presbyterian Church (WPC) in southwest Fort Worth will host a Holiday Gift Market on Saturday, Nov. 16, 2013, from 10 a.m. to 3 p.m. Vendor categories include bath & body, clothing & accessories, home décor, food and gifts for children, adults, pets and more. There will be handmade crafts, lots of raffle items and a Cozy Café for tired shoppers wanting take a break. There is no cost to shop! All proceeds benefit local and international causes such as Tarrant Area Food Bank, Presbyterian Night Shelter, Union Gospel Mission, Bread of the World and Haiti Education Fund, among others." "Taste of Northeast is an annual charity event, with proceeds going to benefit Arts Council Northeast and its community arts programs. Bring your appetite and your gift list! There will be food from area restaurants, shopping, live entertainment, and a silent auction. Taste of Northeast offers a great opportunity to shop for the holidays. Our many vendors will be offering specialty gift items that are sure to delight. We’ll tempt you with beautiful and unique jewelry, art, and clothing, along with gift certificates for pampering your favorite people. Shopping won’t be a chore when you can shop while eating, drinking, and enjoying live music. Spend your dollars locally, and you’ll also know that you’re helping your own community!" Admission is $25 in advance, $30 at the door/day of event. "Join us for a holiday shopping event on November 16 and 17th at Treasures 'round the Tree. We are located in Allen, TX and this is our first year to showcase the designs of talented artists and crafters." Admission Fee is $5.00 for adults. Children are free. "This is the 3rd Annual Holiday Craft Market at Parkwood Retirement Community. With lots of vendors showcasing all sort of handmade goods including, jewelry, toys, gifts, cards, home decor, hand carved canes and walking sticks and baked goods galore, just to name a few." Located behind HEB Hospital at Westpark Way and Parkview Ln. Please enter throught the main doors. "Join us for a fun filled day in the magical yard! One-day local fine craft show featuring works in glass, wood, fiber, jewelry, sculpture, pottery and more! Perfect for finding the holiday gifts your friends will rave about. Free, kid friendly, no pets please. Residential street parking." Just south of NW Hwy, east of Inwood. The show is held in a residential back yard. "6th Annual VFC Craft Show will be held at Victory Family Church located at 455 NW John Jones Dr. in Burleson on November 16, 2013. There will be over 70 + indoor vendors selling a wide variety of handmade items, as well as, nationally known brands like Mary Kay, Scentsy, etc. Show hours are from 10 am to 4 pm and will include hourly drawings for door prizes donated by our show vendors. Booth rental information can be found at www.victoryfamily.com under the Women's Ministry tab. " 455 NW John Jones Dr.
"The event is to help us raise money for our Children's playground area. Kids Kraft Korner- $10 a kid, includes an hour of kid free shopping and four make and take activities. Activities include making a Christmas shirt, reindeer food, homemade glass ornament, and ceramic tile art. Also Christmas story and movie time. Vendors: Scentsy, Grace Adele, Velata, Thirty-One, Tupperware, MaryKay, Silpada, Pampered Chef, Homemade jelwery, Homemade Crafts (wood working, bows, Christmas decorations/gifts) gift wrapping, hot cocoa and lemonade, baked goods made from scratch. "Come on, Come all! Lets get ready for Christmas at our MOPS Countdown to Christmas. Come see over 40 vendors and collect all your unique, one of a kind presents for friends and family!" "Family Friendly Event includes a Make'n'Take Craft for children, TBM Disaster Relief Unit for men's interest and lots of shopping opportunities. Event will be held Rain or Shine." "This event will have a Scentsy Vendor, along with other vendors. This Craft Show will have a little bit of everything for any shopper. Shoppers can come out and get there early Christmas Shopping started." "Holiday shoppers can find it all under the Mistletoe at North Texas Christian Academy 3201 North Central Expressway McKinney, TX 75071. From gourmet goodies, fashion, home & holiday décor to personalized items, children’s goods and handmade treasures. The Mistletoe Market draws vendors form other parts of Texas, Arkansas, Oklahoma & Louisiana for the event on November 16." At the cross roads of Wilmeth road and Highway 75. "Our 1st Holiday Bazaar had close to 80 vendors 400+ visitors in attendance. With our first year behind us, we are looking to top numbers with an even bigger and better event."